Mediterra Restaurant owes its name to the Mediterranean gastronomic culture: synonymous with quality, freshness, lightness. The light, the purity of the glass, the blue of the water, the scent of the sea combine to create the evocative atmosphere that enhances the kitchen’s creations. Mediterra’s culinary offerings represent a unique blend between the abundance of the sea and Veneto’s fertile lands, reinterpreted with international touches and innovative twists. The aromas and flavors of the best seasonal ingredients and the selection of the finest wines make each meal a pure moment of physical and mental pleasure. For lunch, Mediterra offers creativity and lifestyle with eclectic salads, tantalizing light lunches, delectable finger food choices and refreshing fruit bowls. Mediterra Privé is a private space inside the restaurant specially reserved for guests in search of a more intimate culinary experience or wishing to add a touch of privacy and exclusivity to their dinner. At lunch and dinner, the cuisine is exquisitely Italian, with an emphasis on local flavors. Only the freshest ingredients for the best menus inspired by Mediterranean and international cuisine. Let yourself be transported on this journey through flavors that envelops all six senses. Mediterra Restaurant is led by the talent and creativity of Chef Salvatore Pullara, a native of Sicily, land of wonderful aromas and flavor, which inspire and enrich his cuisine with original and contemporary reinterpretations, in perfect harmony with the Venetian tradition. His dishes are a perfect combination of impeccable taste and refined presentation. A warm welcome awaits you on the pool terrace with relaxing views of the sea, to start the day with tranquility and genuine products. Our extensive American buffet, served until 11.00, offers authentic Italian breakfast as well as international flavors. The open expo kitchen, where you can watch the Chef artfully create sophisticated dishes and savor your luxurious breakfast through the nose and the palate, provides an enthralling and sense awakening experience. 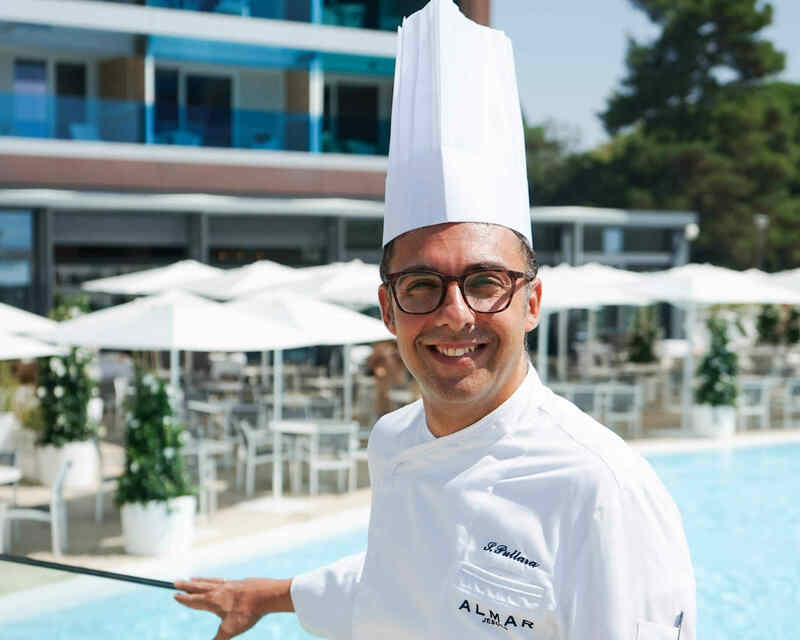 For lunch, a fresh and contemporary interpretation of Italian cuisine, in the splendid setting of the sun terrace by the pool overlooking the sea or in the dining room. Lightness and international allure are accompanied by attentive service and an à la carte menu with dishes featuring the catch of the day or light salads. 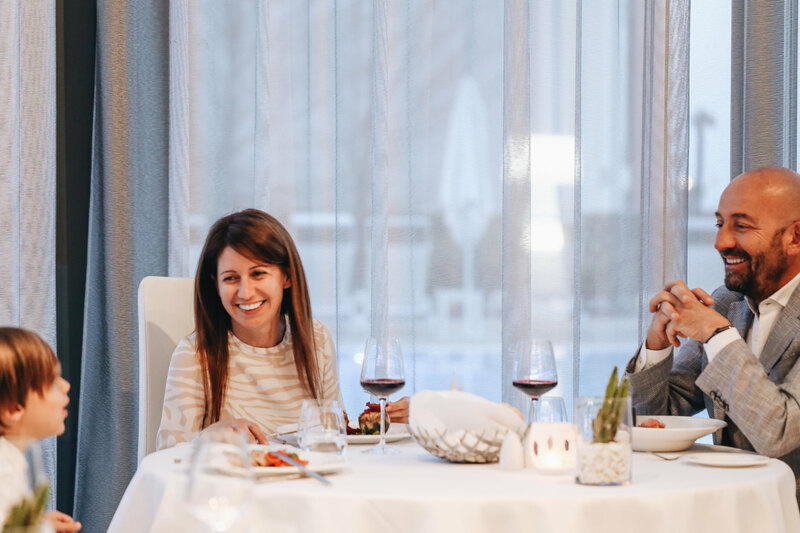 Celebrating the cuisine of the Italian tradition with international influences, the evening menu is characterized by harmonies and sophisticated experimentation, creativity and attention to aesthetics. A real gastronomic journey from appetizer to dessert in true Mediterra style. Exclusive atmosphere and glamour in a stylish environment, surrounded by our attentive and experienced restaurant staff.